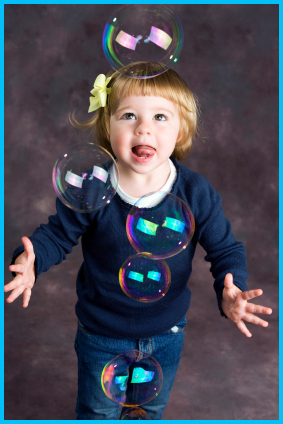 Kids love bubbles! They are fascinated with the rainbow of colors floating through the air. Homemade soap bubbles are easy to make for little or no money at all. I bet you will find these ingredients right in your kitchen, without having to use glycerin. Glycerin bubbles last longer but can be expensive to use. You don’t want to create foam, so mix everything gently. Tip: Distilled water is best, but you can use tap water. Hula hoops make really big bubbles. There are all sort of different bubble makers on the market, but if you are going to go out and buy one, The Bubble Thing, is a tried and true find.